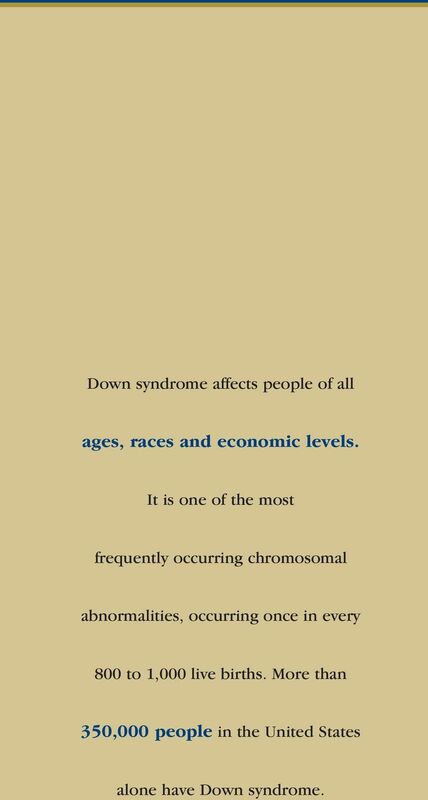 Download "NATIONAL DOWN SYNDROME SOCIETY"
2 Down syndrome affects people of all ages, races and economic levels. It is one of the most frequently occurring chromosomal abnormalities, occurring once in every 800 to 1,000 live births. More than 350,000 people in the United States alone have Down syndrome. 19 ndss about down syndrome About the National Down Syndrome Society Our Vision: The National Down Syndrome Society envisions a world in which all people with Down syndrome have the opportunity to realize their life aspirations. NDSS is committed to being the national leader in supporting and enhancing the quality of life, and realizing the potential, of all people with Down syndrome. Our Constituents: Today, there are 350,000 people in the United States living with Down syndrome. Each of these individuals touches the lives of family members, educators, employers, health care professionals, peers and others. This network of people who are affected by Down syndrome numbers in the millions. Our Programs: Education. 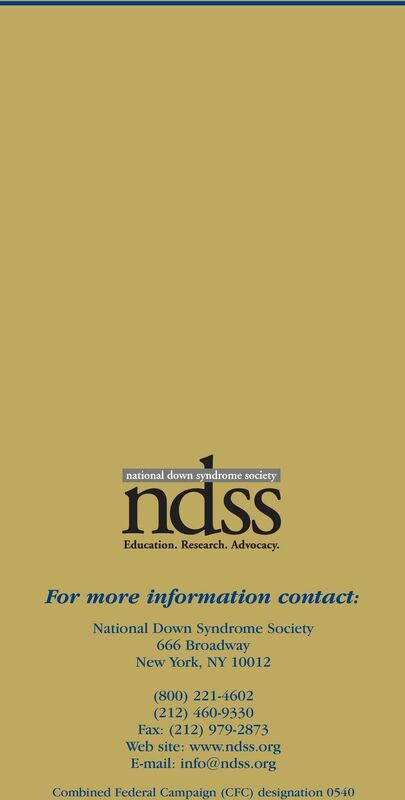 Through our model programs, award-winning Web site, national conferences, Information and Referral Center and more, NDSS provides targeted, in-depth information that meets the diverse needs of our constituents. Research. The Society hosts international research conferences and funds research both independently and through a partnership with the NIH. NDSS is the largest private funder of Down syndrome research in the U.S. Advocacy. In cooperation with our more than 165 affiliate groups, NDSS influences important local and federal legislation, established October as National Down Syndrome Awareness Month, organizes the national Buddy Walk program and much more. NDSS thanks Basic Biomedical Research at the Eleanor Roosevelt Institute in Denver, CO, for providing the karyotypes and map of chromosome 21 in this brochure. The information in this brochure is provided for educational purposes only and is not a substitute for medical advice or treatment. Cerebral palsy can be classified according to the type of abnormal muscle tone or movement, and the distribution of these motor impairments. Cerebral Palsy. In order to function, the brain needs a continuous supply of oxygen.